I finished a quilt! 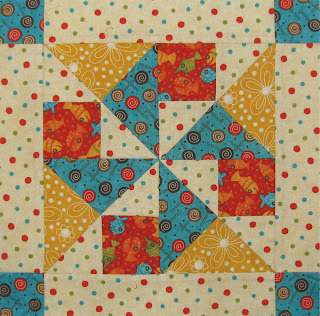 One of those just because quilts. When I was in Sioux City last year, I picked up a jelly roll -- flannels. One of the vendors was setting it out as she was setting up. I immediately picked it up. I may have even picked it up out of the box it was in before the shop owner could set it out. There was only one. I tried setting it down, but it didn't work. 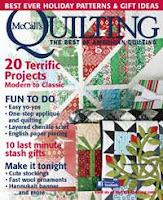 After seeing this magazine, Quilts and More, and falling in love with the cover quilt, I decided that is what the jelly roll was destined to be used for. Of course, I had to adapt the pattern a little. I used the whole length of the brown background that was cut into 2.5" strips. I sewed it on one end, laid it out, made a random cut and sewed it to the other side. Their way is easier. I still like my way better, and my quilt ended up a little wider. One thing I learned from Jean Wells at Quilt Market last fall was to bring some of your color down. Clump most of the blue, but bring some down. Clump most of the yellow, but scatter a few up and down. It was a little scary doing this, but I like the results. It is flannel front and back with wool batting -- yummy!!! Notice the lighter color middle right? Well, it had been so cold lately that we started using it when it was half bound. Of course, that meant that the baby threw up on it. I finally finished binding it so I can wash it. As a former math teacher, physics equations looked fun to me! And not to forget the binding. . . I bind a lot of quilts by machine. It's faster. I did bind this one by hand. In the comments, there are some great tips for binding, links to great videos, etc. They were all informative, and I appreciate all the helpful information. Thanks! I decided that I may have been using cheap thread on the ones that I have that have popped. 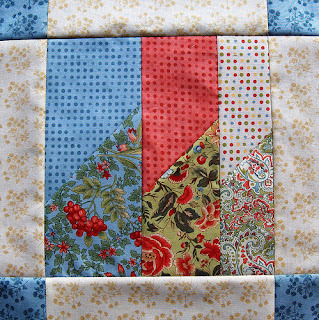 The binding had popped in spots on a couple of my older quilts before I knew about quality materials. I am pretty much hand sewing my binding the same way I always have because it seemed very similar to others -- just using better thread now. Now to get that quilt washed! If you haven't joined the relief movement yet, this may be one way you might join in. 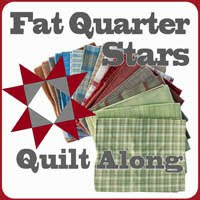 As a long arm quilter, I belong to a yahoo group called Statler Sisters. We received this note from Wilma, one of our "siblings." My dear Statler sisters and brothers. The block mentioned as one to make is the Rail Fence Block, but they also mention orphan blocks, so it sounds like any 12" block will do. Great place for orphan blocks! Lots of winners today, horray! First off we have three winners from Celine Perkins. 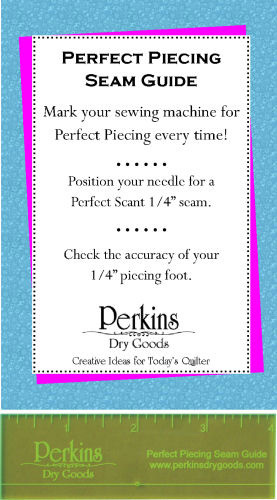 These three have won a Perfect Piecing Seam Guide! Congratulations! 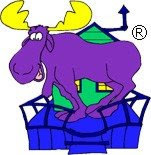 Email me your info to claim your prize -- kluckau@moosequilts.com. Okay, now you can see block 7. Wait! First you have to meet Celine. Celine Perkins is the designer of block seven. You might know her as Perkins Dry Goods. HERE is the link to her blog. 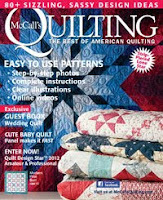 She has been in the quilting business as long as I have, except we've never met as she lives in Minnesota. That's a long way from Utah. I don't know why I haven't met her at Market. Probably because we have both been in our own booths busy, busy, busy! My name is Celine Perkins and my blog is A Few Loose Threads at http://www.perkinsdrygoods.com/blog. 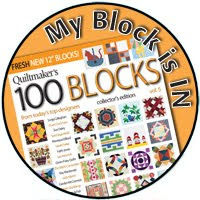 I am very happy to be included in this quilt along and I hope you like my block! 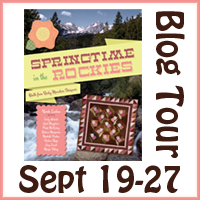 Stop by my blog today and leave a comment - I'll be doing a giveaway too and it's a surprise! I have loved to sew for as long as I can remember. My mom used to make all of my clothes when I was little, probably up until my wonderful teen years. She taught me to sew. 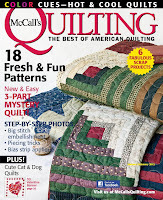 I started quilting in 1983. I took a class with a co-worker and was totally hooked after that. 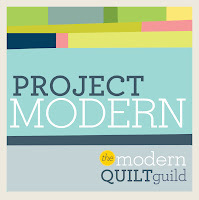 I started teaching quilting in 2000 and it seemed like a kind of natural progression to move into designing and writing patterns for quilts. Whenever I taught a class, I always re-wrote instructions, simplified things or added tips. Then I started designing things to teach. Perkins Dry Goods was born about 2 years later in 2002. I have published close to 40 patterns and self published 3 books. I love quilting and creating. I'm married and have three children, two are away at college and one is a junior in high school. Zola the yellow lab and Rosie the Siamese kittiot round out my family. We live in suburban Minneapolis and right about this time of year, someplace warm and sunny sounds really good! CLICK HERE for the instructions to Block Seven. Here is the picture of Celine's block. 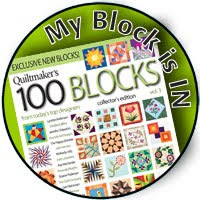 Here is the picture of my block. I picked the stripe to be my background color. I think I would have been better off using the light green as the background. The stripe is very dominating. 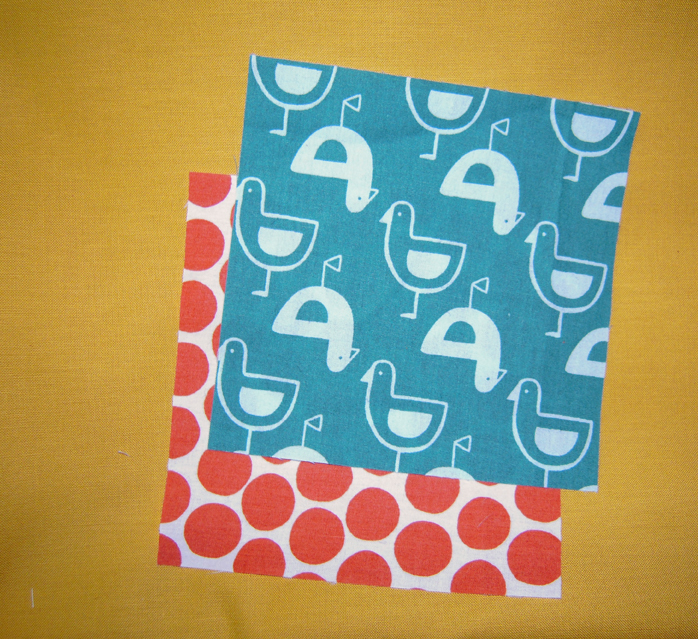 The busy fabrics I am using have been a great learning experience for me. FYI, the pattern calls for 5 layer cake blocks. I used three. 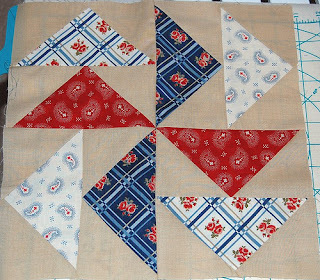 Both sets of squares, I had scraps I could use. Just something to think about. Also, when you are putting together the A and C triangles (see pattern) make sure you get them in the same order each time. Those could be easily sewn together incorrectly. One last thing, this block looks harder than it is. You may not have assembled something like this before. Give it a try. Just be careful not to stretch the seams, as Celine notes in the pattern. Well, any pictures posted in the flickr group by tonight will be entered into the first drawing. About 10 ish tonight (Mountain Time) I will post my Block SIX. All blocks BEFORE mine are those entered into the first drawing. It doesn't matter which block - just the one's posted before mine. If you post your block AFTER mine, then it will be entered into the next drawing. I will post the winners tomorrow. 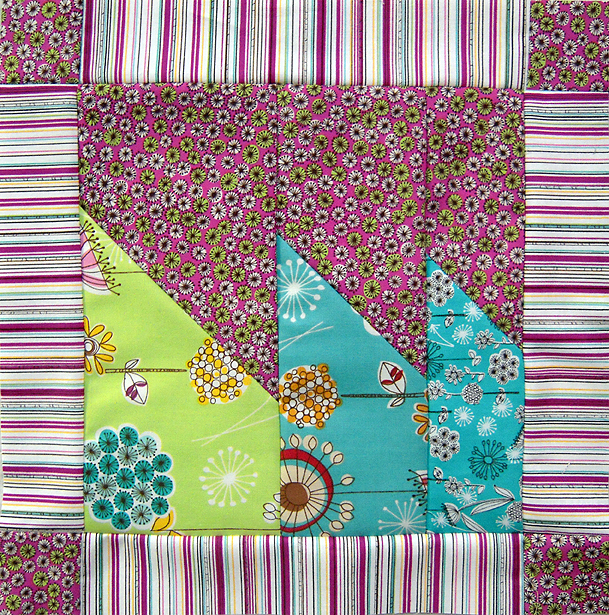 Toby has donated THREE of her Perfect Piecing Seam Guide as our prize tomorrow! Thanks Celine! What do I have? I have a couple charm packs that would love to find their way to you. So I'm in the middle of putting a new book together for spring market. The first draft of the book is done. Quilts are being made. Patterns are being tested. Patterns have already started being revised. 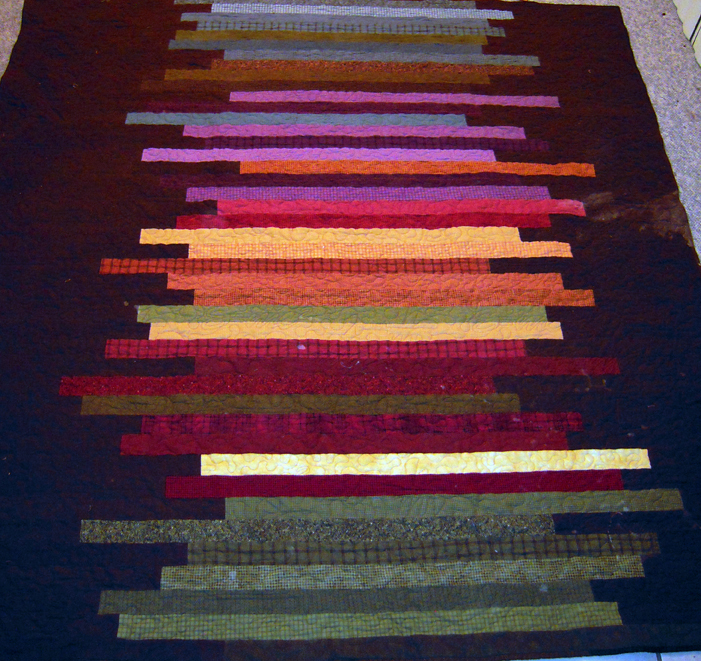 I am going back and forth on one of the quilts, and thought I would ask your opinion. 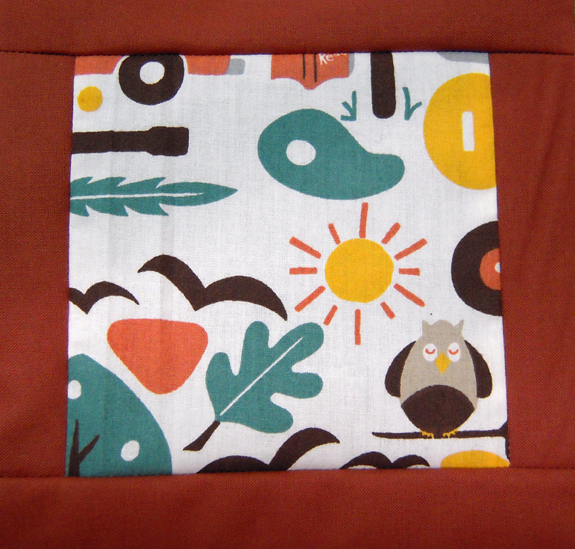 This quilt is made with Birch Organic Fabrics. The line is Circa 60 Beach Mod. I am putting them together with solids. There will be two colors of solids, white and one other one. The problem is I can't decide! I keep changing my mind. What do you think? Rust or Mustard? I see the rust and I am in love with the rust, but then I see the mustard yellow, and I really like that option too. Both look good, so what do YOU think???? My computer isn't working well, so right to the winners. . . This is one of those weeks where I say, "Thank heavens for a quilt along!" 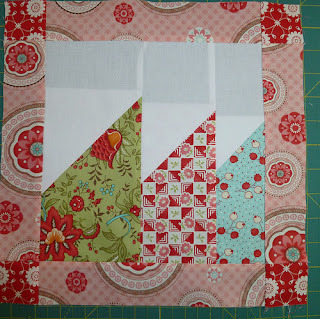 I say this because the only time I made it to my sewing machine in the last two weeks is to make this quilt block. So sad! I got fabric in the mail yesterday for some of the quilts for my next book so I hope to spend some quality time with my sewing machine today. Oh, but you want to see block six! Okay, here goes. . .
Block six is brought to us by Toby Lischko. 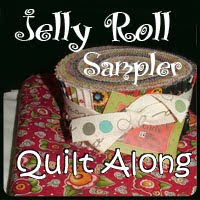 Toby made a block for our Jelly Roll Sampler and then came back for another round! 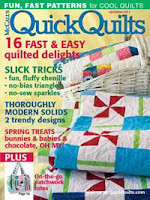 If you have picked up a quilt magazine in the last few years, you have seen Toby's work, but I'll let Toby introduce herself. 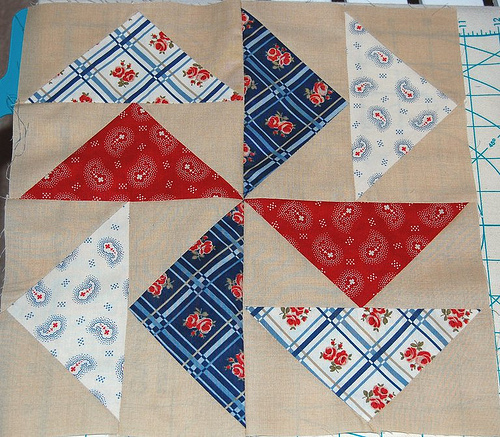 I come from a long line of sewers; my mother and her father both did tailor work (lots of hand work) but I am the first quilter in my family. Always a crafter; I have been doing some type of craft since I was 7 or 8 years old. You name the craft and I have tried it. 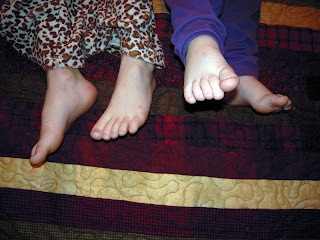 Quilting is the one craft that I have stuck to the longest and find the most rewarding. 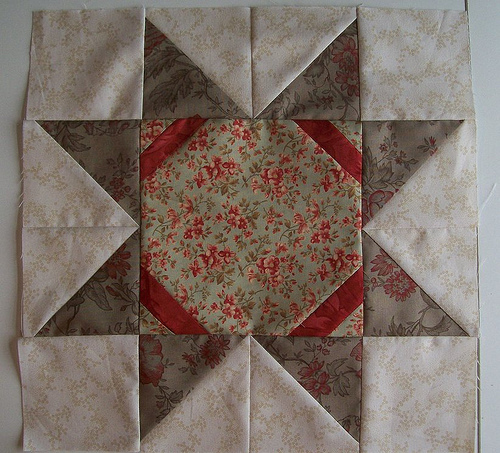 It never gets boring, and I love to design quilts! My block is a part of a design that is in a free pattern on Timeless Treasures website http://www.ttfabrics.com/ called Pointing the way. You can download the pattern from there. The block is very easy to construct and is purposely made a little larger so you can cut it to size. You also have the option of using my Cutting Corners template set to eliminate the need to draw a diagonal sewing line. I started my website http://www.gatewayquiltsnstuff.com/ 2 years ago and my blog http://gatewayquiltsnstuff.blogspot.com/ 1 year ago. I do not post often but try to incorporate some lesson in each blog. 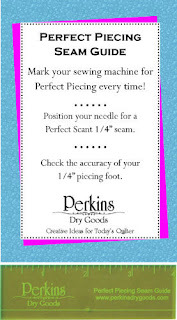 You can find basic lessons on accurate piecing and my favorite and specialty, curved piecing. 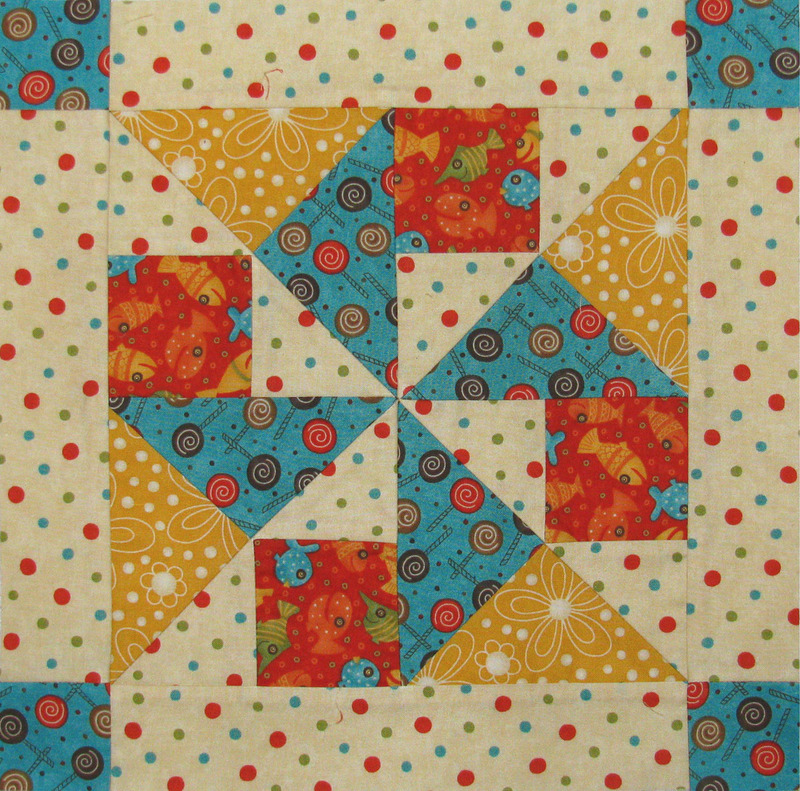 If you like samplers I have a new published one in Fons & Porters Love of Quilting called Civil War Sampler. Great for those who love Civil War reproduction fabrics. The collection is by Pat Nickols for RJR called Civil War Ladies. Both Fons & Porter and I carry the kits for it. Enjoy making the blocks in this sampler. Thank you Konda for including me again. 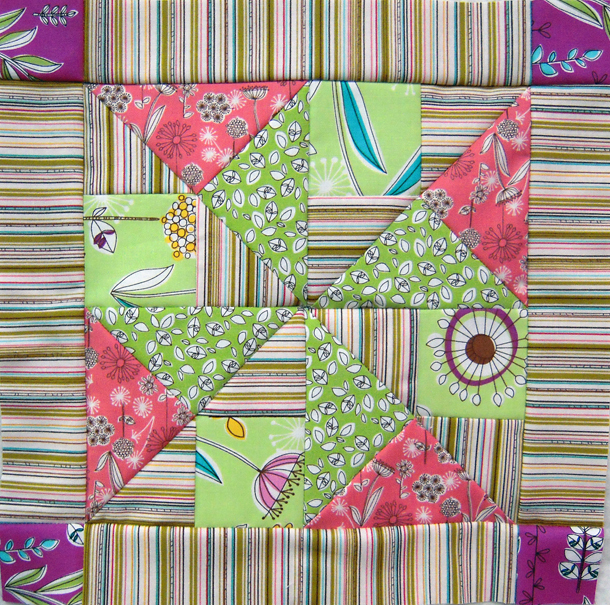 I loved seeing the blocks people created with my Jelly Roll design. 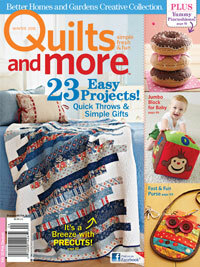 There are a lot of very creative quilters out there! As I say in my blog “Always do what you love and love what you do”. CLICK HERE for the instructions to Block Six. Here's a picture of my block. 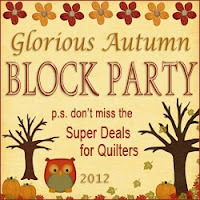 I know some of you are getting nervous about having enough material to finish the quilt. I think will be alright. I used this block to illustrate what I mean. 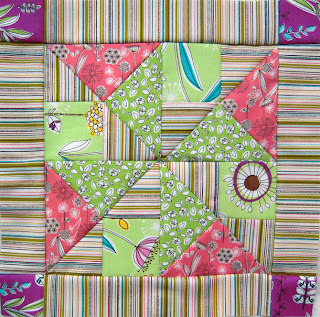 In this block, I picked fabrics that aren't my favorite -- the small pink flowers and the stripe. There was just enough left from cutting the inside pieces to cut the corner squares. 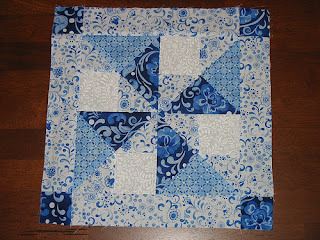 Then the blue pieces are scraps from other blocks. The green was from a new square, but it left a large piece left for something else. Since we are halfway now, maybe you have some scraps to start working in. Now, if you don't want to use some of your less favorite pieces or want to have more control over colors, there may not be enough for that. I heard some of you are grabbing a few extra fat quarters. That is definitely an option. Up to you. I like having choices. 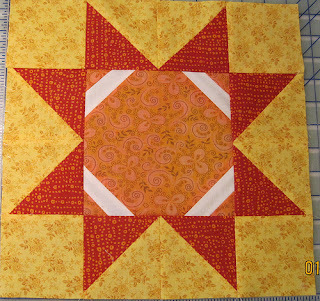 Isn't that fun to see what a whole quilt looks like using the block! 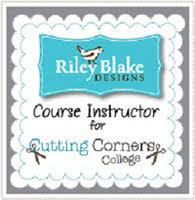 Also, Toby mentioned her Cutting Corners Template. Here is a picture of what that looks like. Well, any pictures posted in the flickr group by tonight will be entered into the first drawing. About 10 ish tonight (Mountain Time) I will post my Block FIVE. All blocks BEFORE mine are those entered into the first drawing. It doesn't matter which block - just the one's posted before mine. If you post your block AFTER mine, then it will be entered into the next drawing. I will post the winners tomorrow. Toby has donated one of her Cutting Corners Templates as our prize tomorrow! Thanks Toby! What do I have? Let's see. . . I think I have a layer cake hiding in my sewing room that needs a new home. 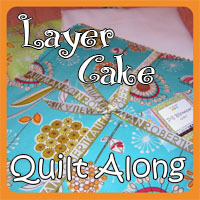 Are you back to sewing so you can give my layer cake a good home? Last year I found out that Pantone names a color of the year every year. Last year, the color of the year was turquoise. I was surprised at how much turquoise I saw -- especially in quilting. This year the honor of color of the year goes to Honeysuckle! Congratulations Honeysuckle! HERE's a link to the announcement. The author of the article suggests painting one wall in a room this color. WOW! That's a little too bold for me. Evidently this color lifts our spirits during times of stress. My favorite quote from the article is, "But be warned – once you try this arresting shade, it can become addictive." 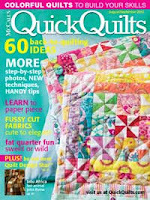 Reading about this color makes me want to go make a quilt!